The rivers in India are considered holy places, and a sign of religious significance, and play an important role for indigenous people in diverse ways and a part of every Indian life. Every region of India is studded with several major rivers. The river is treated as a natural waterway of freshwater flowing into remarked as an ocean, sea, lake or rivers. 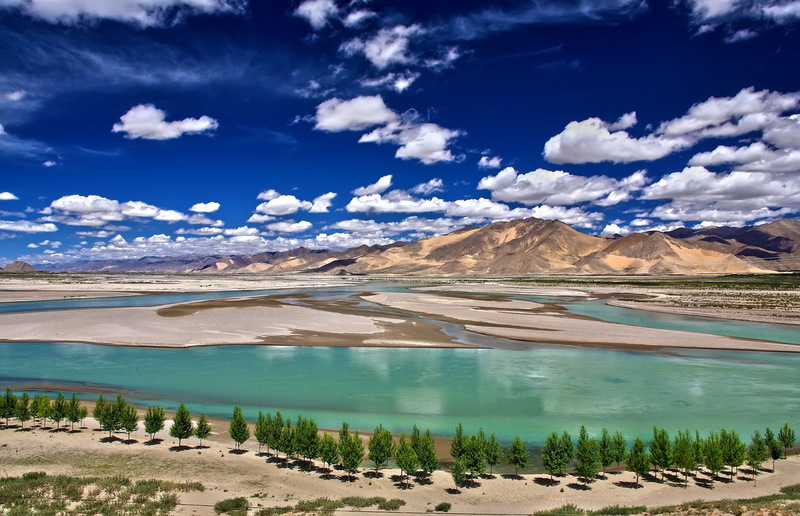 The Indus River is the longest river of India, total length of the Indus from its source (Tibetan Plateau) is 3200 km. Here India Visit Online listed only top 10 rivers in India to see what it means for a common man of India. Check these sacred rivers in India to gain an insight of Indian spirituality. Several of these rivers of India also offer a bright range of adventure activities. The Indus River (Sindhu River), one of the longest rivers in Asia. The Ganga river, well known and declared as the National River of India. The Godavari river, one of the sacred rivers of central India, near Nasik in Maharashtra. The Krishna River, one of the longest rivers in central-southern India, rises in the Western Ghats near Mahabaleshwar. The Yamuna river, which is the lifeline of Delhi, also called Jumna, the major river in northern India. The Narmada river, which originates from the Amarkantak hill in Madhya Pradesh in central India and the 5th longest river in the Indian subcontinent. The Mahanadi River, one of the important rivers of Chhattisgarh State in East Central India. The Great Kaveri River, also written Cauvery in English, rises in the Western Ghats and flows in south and east through Karnataka and Tamil Nadu. The Brahmaputra River (also named in Bengali: Jamuna, in Tibetan: Tsangpo, in Chinese: Yarlung Zangbo Jiang), one of the major rivers of the Asian region. The Tapti River, also spelled Tapi river in central India, rises in the Gawilgarh Hills near Multani in the Betul district of Madhya Pradesh state. We have listed here all important rivers in India with its tributaries and location and other aspects and to enhance your knowledge. We hope you’ll enjoy this article about a list of top rivers in India by length here.